If the unscientific poll we conducted on tablet operating systems is any indication, it appears as if Canonical can depend on a community of early adopters if and when a tablet is released with Ubuntu OS preinstalled. In our poll we asked, “What operating system would you be most likely to consider for a tablet if available?” The options were Android, iOS, BlackBerry 10, Windows Phone 8, Windows RT, Ubuntu, webOS, None of the above and Other. Those who chose the “Other” option were given the opportunity to name another OS. A total of 85 people took the poll, with an overwhelming majority, 66% or 56 votes, indicating they were anticipating the arrival of the promised tablet version of Ubuntu. Second place Android wasn’t even close, with 13 votes representing 15% of those cast. Third place, with 8 votes or 9%, went to “other.” Of the “other” votes, 2 each went to Arch Linux and Plasma Active, with one of the Plasma Active votes specifying Mer and/or MeeGo as the underlying OS. GNOME Shell, GNU/Linux, Slackware and Linux Mint each received 1 vote under the “other” category. Among the remainder of choices offered by the poll, Apple’s iOS garnered a 3 vote/4% showing and webOS received only a single vote. 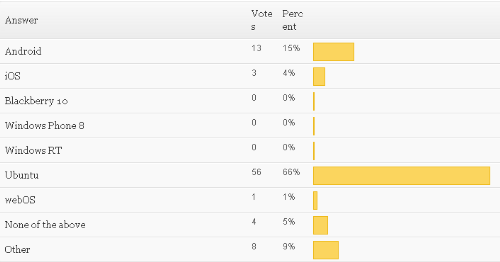 The two Windows choices and Blackberry 10 received no votes whatsoever. The option “none of the above” received 4 votes, representing 5%. In addition to the fact that this sampling is too small to be considered meaningful, there are some other factors that undoubtedly skewed our results. Probably most important is the fact that the poll was placed in the middle on an article on Ubuntu, which certainly has much to do with Ubuntu’s lopsided win here. However, there’s no denying the fact that, skewed or not, this does indicate that Canonical can expect a user community to quickly develop around a tablet bearing the Ubuntu logo. Our results would also be affected by the fact that the poll appeared on a site devoted to free and open softwhere, where most visitors would presumably favor any brand of Linux or BSD over proprietary products from Cupertino or Redmond. Voting in the poll took place over a two week period beginning March 10th and ending March 25th. Voting was restricted by IP address to one vote each. Voting was restricted by IP address to one vote each. This is a useless measure ! If one of the organizers contacts me , I will ecplain ! @arnolds We figure that FOSS Force has a pretty tech savvy audience and that nearly all of our visitors will understand that the restriction “by IP address to one vote each” will in no way guarantee a “one-visitor one-vote” result, nor will it keep anyone who wants to go to the trouble from stuffing the ballot box. However, we also figure we’re not trying to elect the mayor of Chicago with this poll, so there’s no need to call-in Phillip Marlowe to handle security.